To improve outcomes from traumatic hemorrhagic shock by optimizing the acute phase of resuscitation. To develop and implement best practices for prehospital care through to the completion of the acute phase of hemorrhagic shock resuscitation. 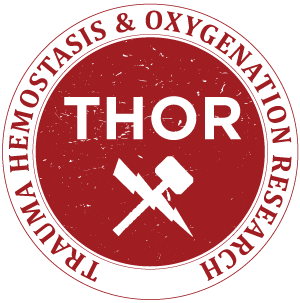 The Trauma Hemostasis and Oxygenation Research (THOR) Network held it’s first RDCR symposium in June 2011. It was a one-day symposium focusing on pre-hospital use of fresh whole blood. The objective of this meeting was to bring together investigators who were interested in analyzing the efficacy and safety of FWB for patients with severe traumatic hemorrhagic shock and to determine the initial steps in developing a research program in this area. A report from this inaugural symposium titled, “Symposium on Fresh Whole Blood for Severe Hemorrhagic Shock: From in-hospital to far forward resuscitations” was published in the journal Transfusion and Apheresis Science in 2012. In 2012 the RDCR symposium expanded to 3 days, with the focus remaining on pre-hospital management of life threatening hemorrhage. Specifically the symposium focused on research improving the monitoring and treatment of hemorrhagic shock from trauma. A 144 page supplement summarizing 20 presentations from the 2012 RDCR Symposium is in press in Transfusion with an anticipated publication data of Jan/Feb 2013. Previous Symposia have included an international group of both Military and Civilian leaders in trauma and resuscitation translational and basic research science. In 2016 representatives from 18 countries, and 4 continents participated in the symposium.